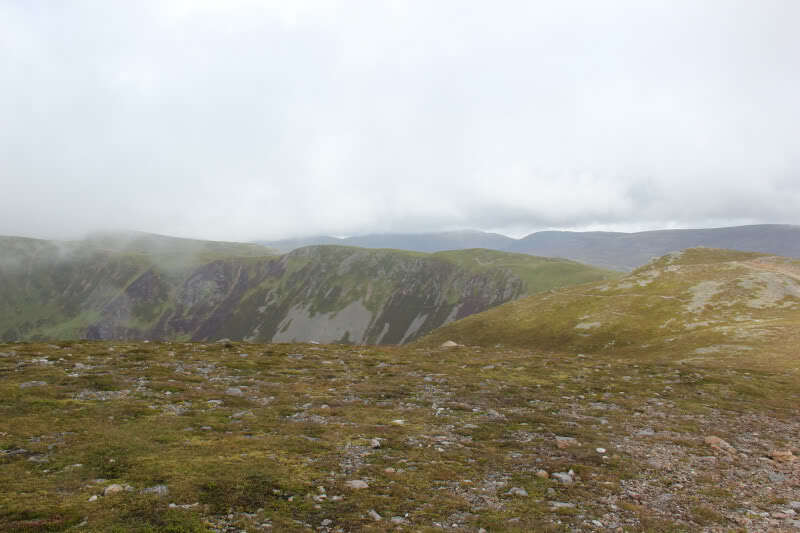 Rachel kindly offered a lift to me and Beinn yesterday to accompany herself on her first ascent of the Cairnwell, Carn a' Gheoidh and Carn Aosda. 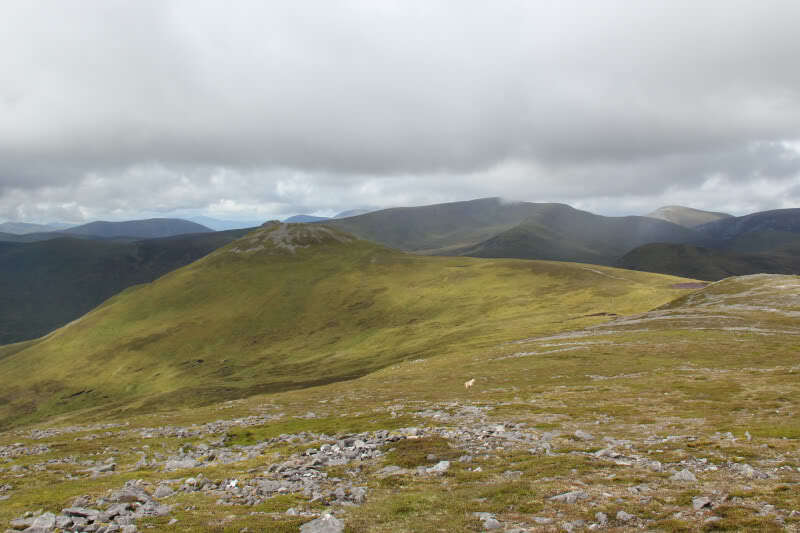 Despite having ascended these hills four times previously, I gratefully accepted as Beinn had not previously ascended these hills and I had not previously ascended Carn Bhinnein of Carn a’Gheoidh – not only a current Munro Top but also one of the original Munros from Hugh Munro's 1891 list. 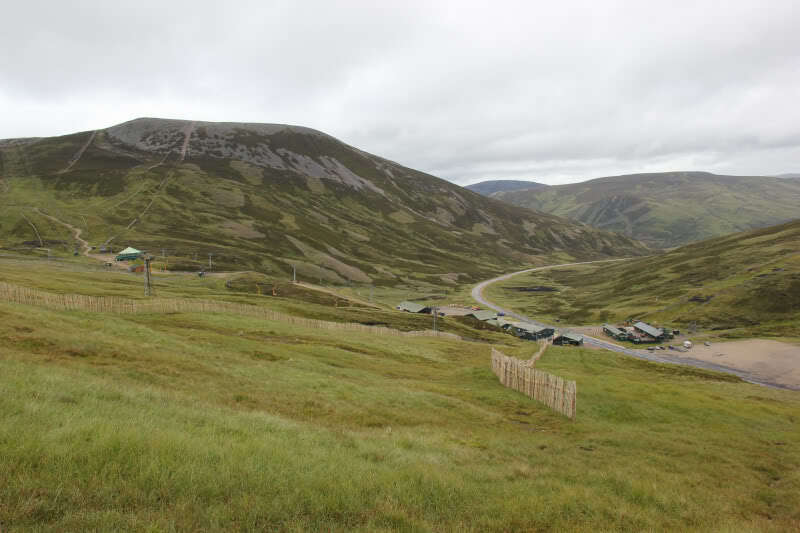 My last ascent of these hills was in November 2008, with Malky, on a day of outstanding conditions – 2008 ascent. 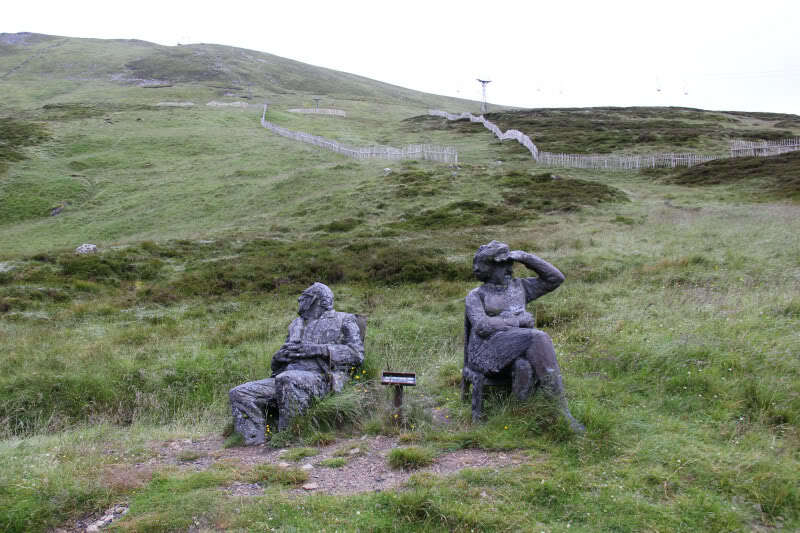 We parked at the large Glen Shee car park and then ascended directly towards the summit of Cairnwell, starting at the sculpture. 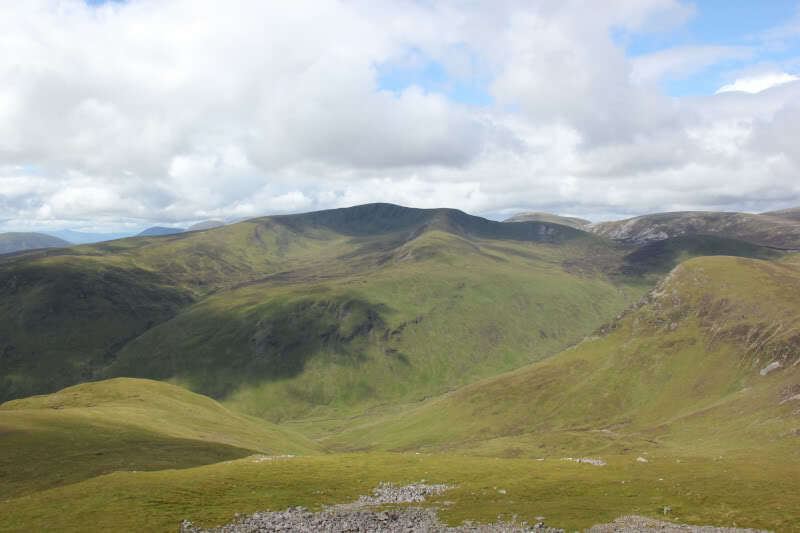 Given the short, easy ascent from the car park to Cairnwell, we were surprised and a bit shocked to see numerous other hillwalkers taking the chairlift up to just below the summit of the Cairnwell. Cheating bandits! The direct ascent didn’t take long, we reached the summit circa 30 minutes after setting off from the car park. 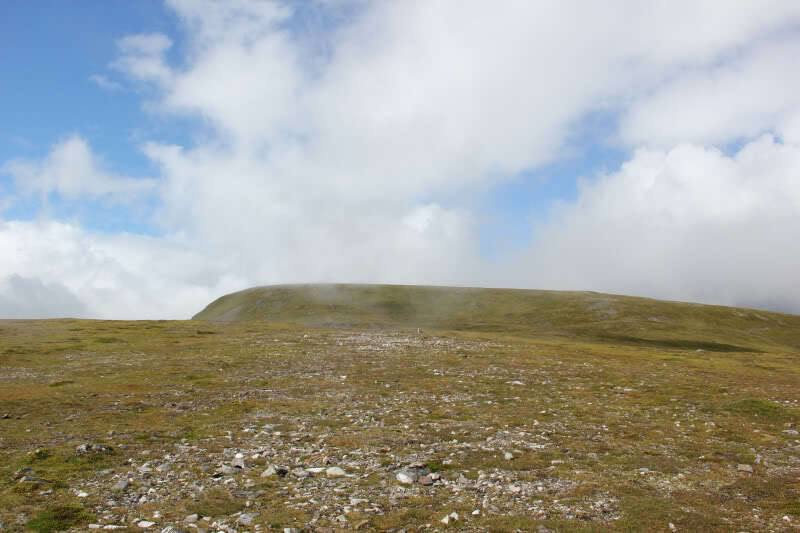 After taking a few photos at the summit, for ourselves and for others, we set off en-route for Carn a’Gheoidh. 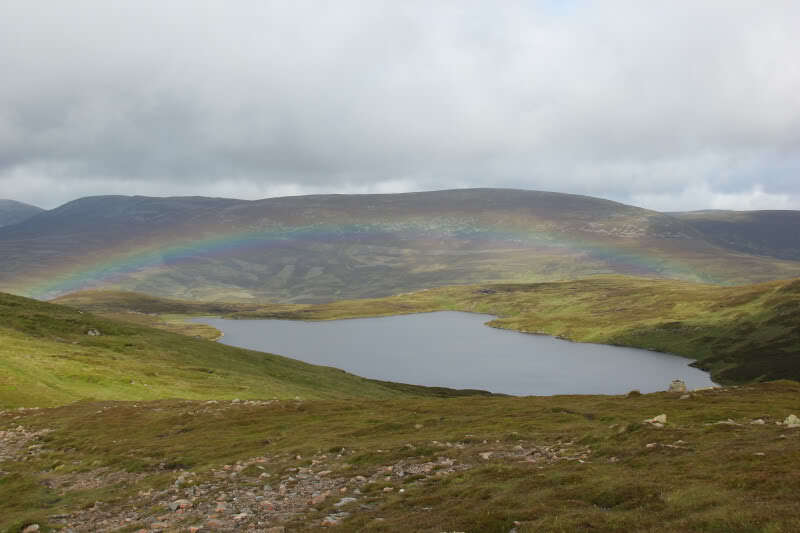 It was nice to see a small rainbow over Loch Vrotachan as we made our way round to Carn a’Gheoidh. This marked the end of a period of showers and the beginning of an improvement in the weather . 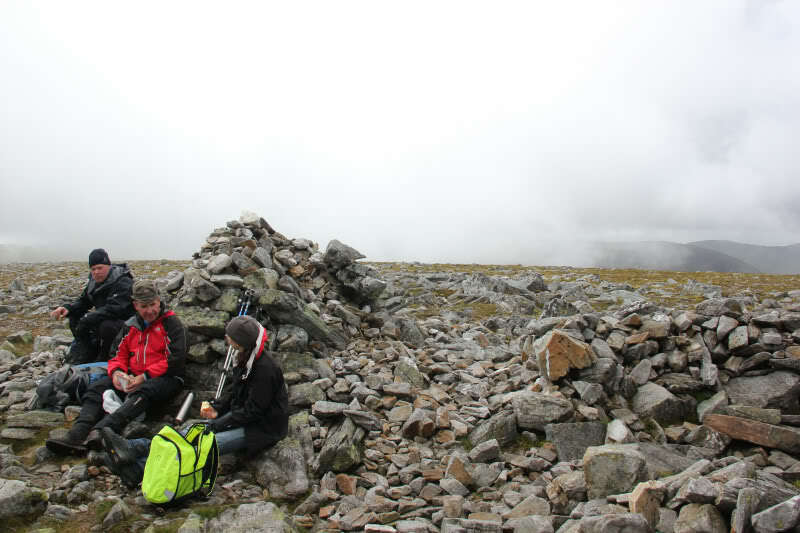 We stopped for a longer break at the summit of Carn a’Gheoidh, where we got the map and compass out to confirm the surrounding hills, including the next target of the day Carn Bhinnein. 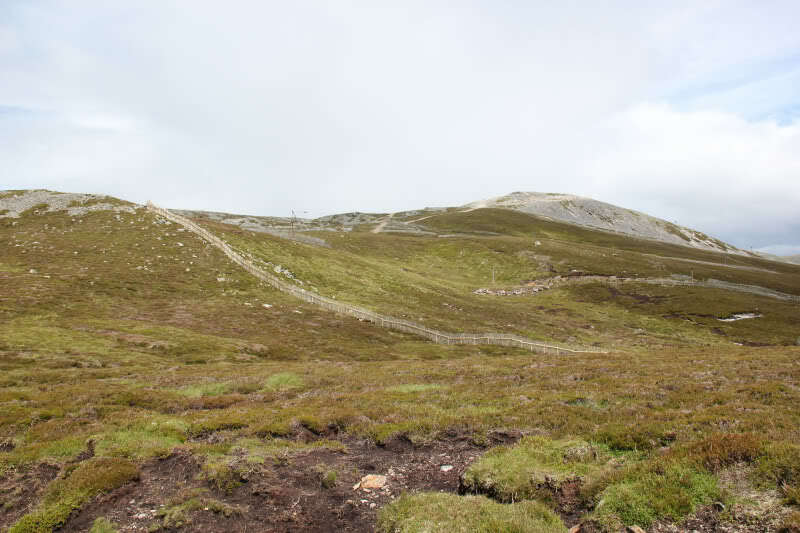 The walk out to Carn Bhinnein was fairly pleasant. 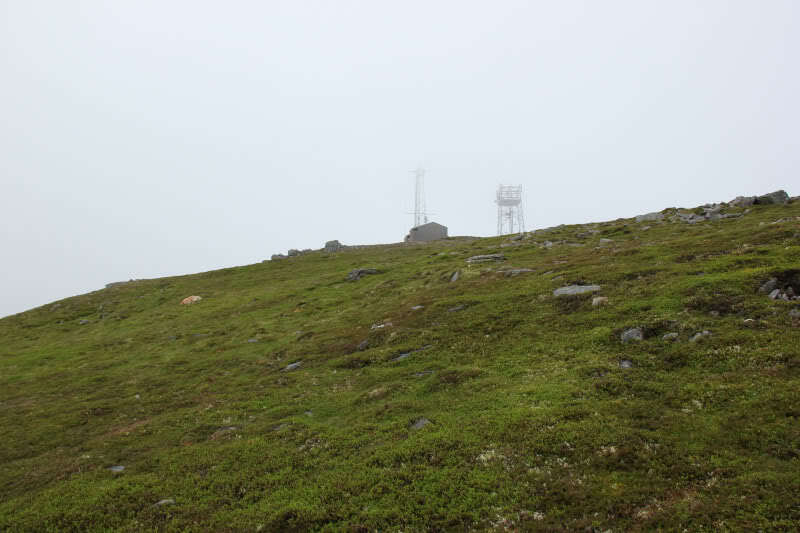 I was surprised that the three other walkers, at the summit of Carn a’Gheoidh, decided to follow us out to Carn Bhinnein. 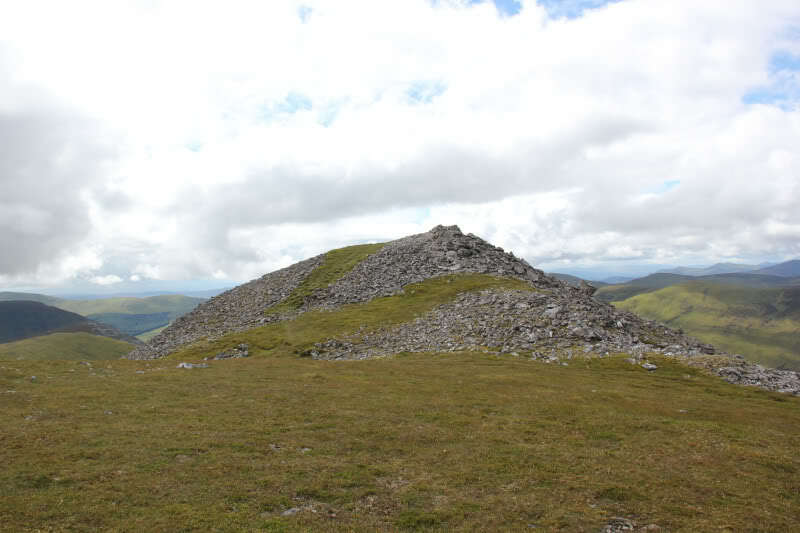 I think Carn Bhinnein was far nicer than any of the three Munro summits. Glas Choire Mhor of Glas Tulaichean is a great-looking coire. 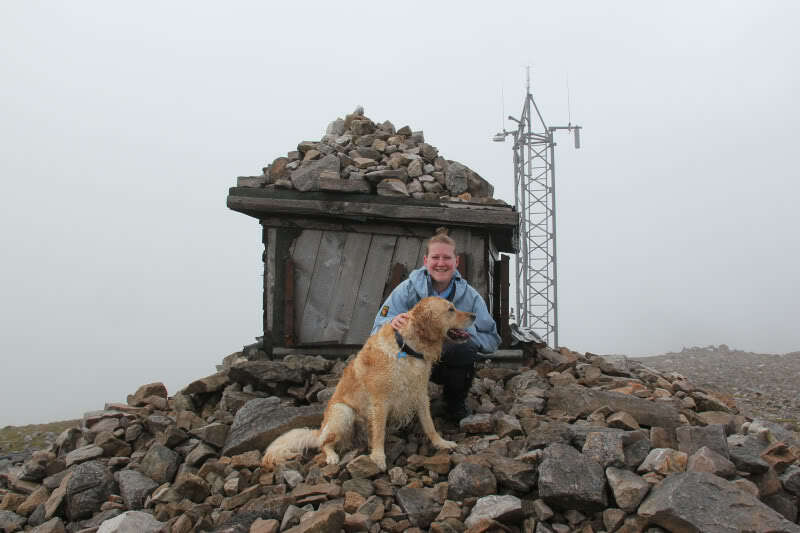 Another 1891 Munro list summit ticked-off, nine more to go. 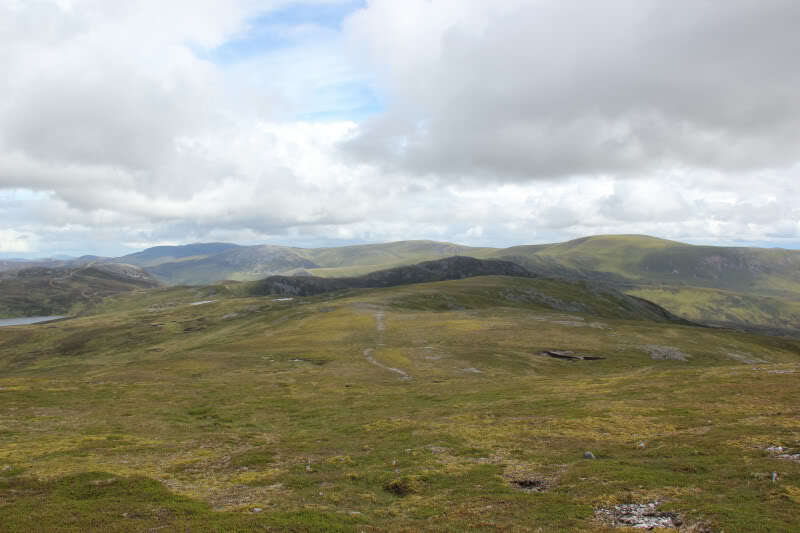 From Carn Bhinnein we returned to Carn a’Gheoidh, where we stopped for our first drink of the day before continuing back towards Loch Vrotachan and onto Carn Aosda. Beinn was off the lead for much of the walk. As we walked back we had a bit of a laugh when we thought we saw Beinn standing in a puddle. 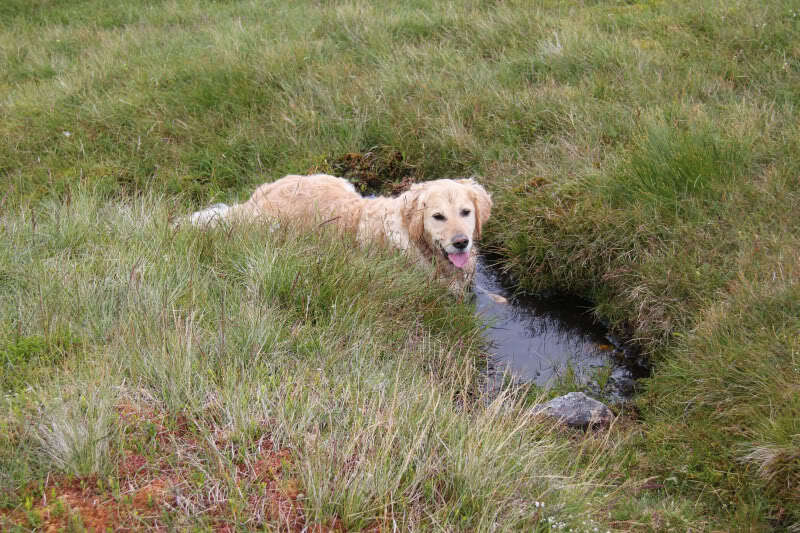 Turns out he was lying down in it and it was full of wet peat. He came out of the water looking more like a Black Lab from the shoulders down than a Golden Retriever. 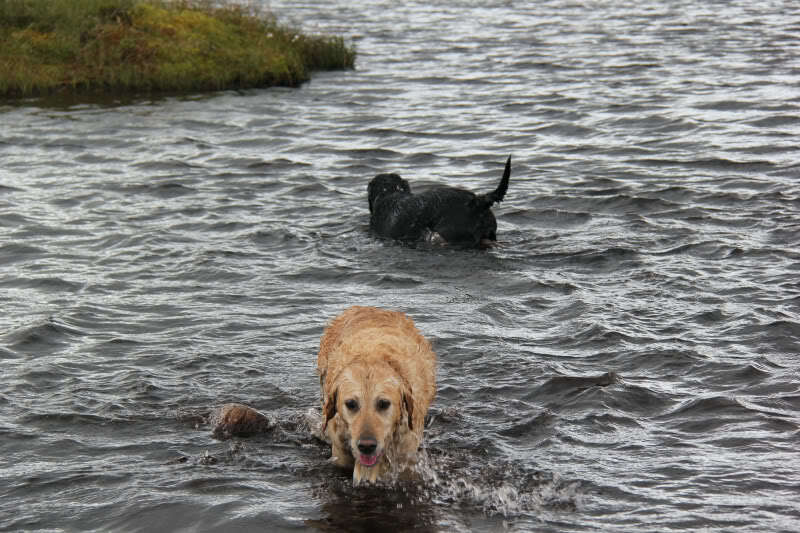 However, not long after we came to a small lochan where we were able to get him cleaned-up by throwing in some stones for him to retrieve. 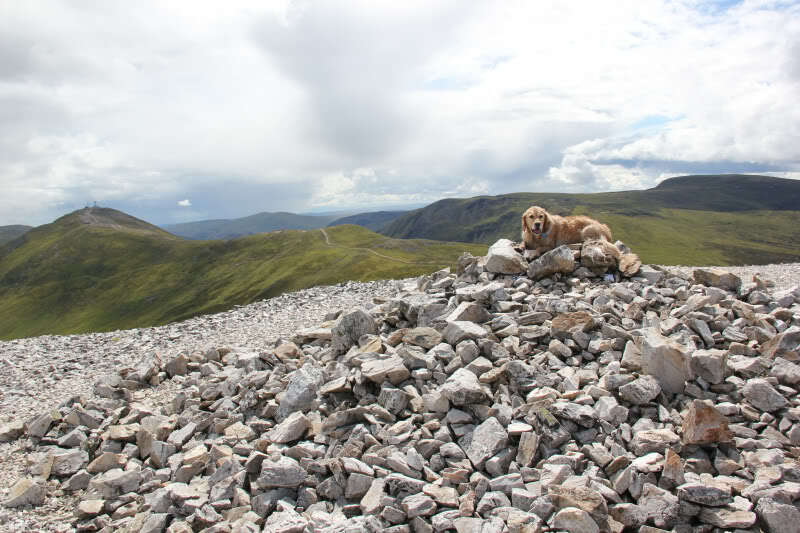 This ended up being a bit of a game between Beinn and another dog - who can get to the stone first. 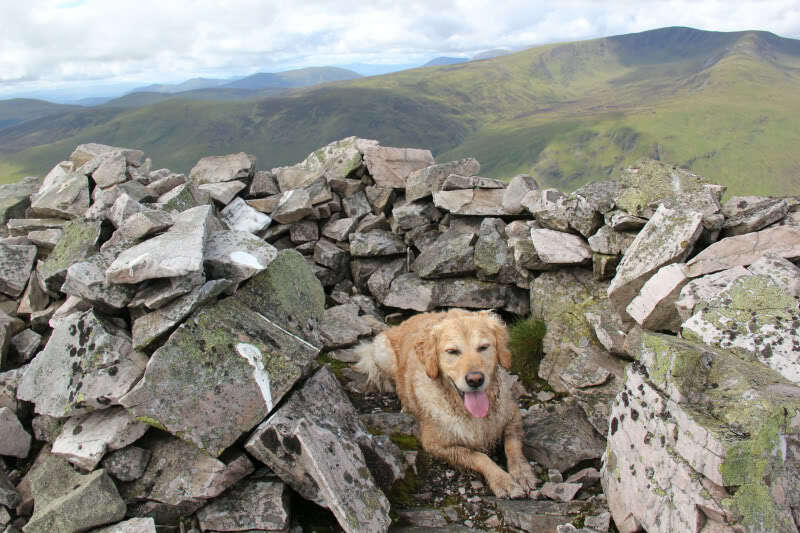 Beinn was then put back on the lead to keep him clean for the rest of the walk. 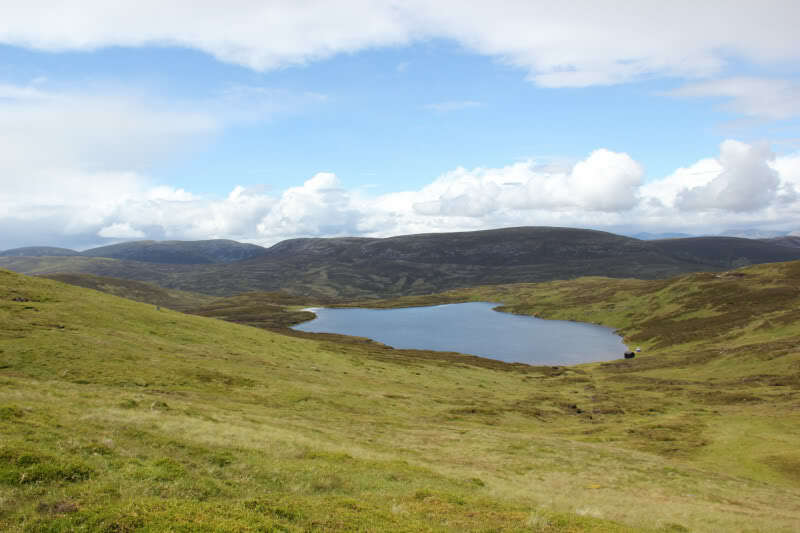 We traversed round the end of Loch Vrotachan before starting the short ascent up to Carn Aosda. 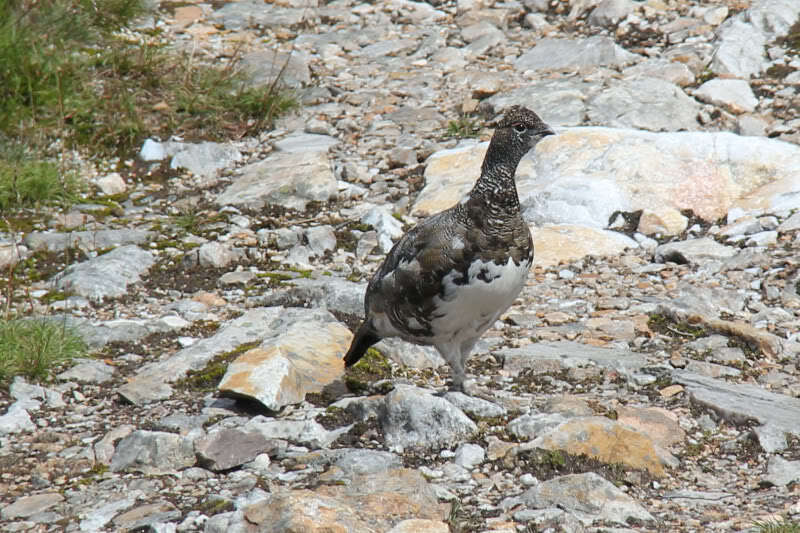 As we followed the path towards Carn Aosda, we first heard and then saw a couple of ptarmigan on the path – really good camouflage. 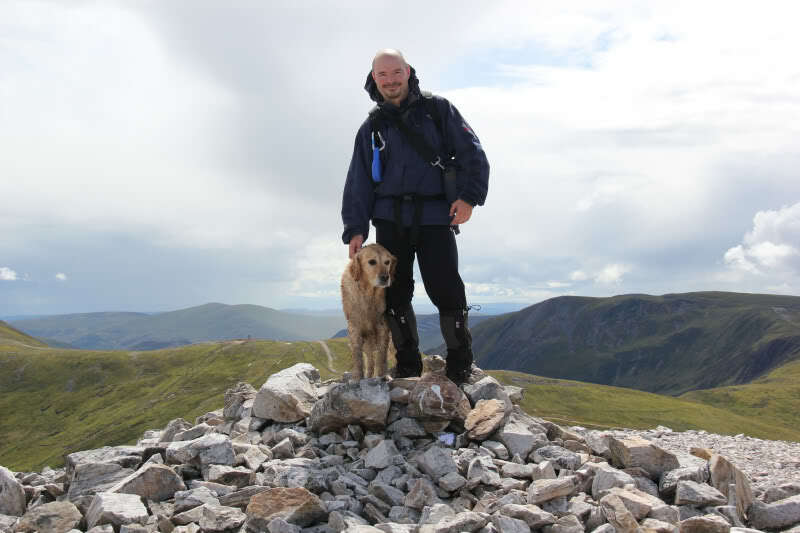 On reaching the summit, where there were about as many dogs as humans, we took a few photos and then descended via what I think is a ski run down to the cafe and then to the Glenshee ski centre. The descent from summit to road couldn’t have taken much longer than twenty minutes. Another great day out in good company.